Oh yes, the time has come for us mums to discuss…Halloween! Now before you say “ugh Halloween is so expensive and decorations always get broken” and all of that other nonsense that we’d expect someone like our great Nan to say, you don’t need to lash out on expensive Halloween items to have fun! 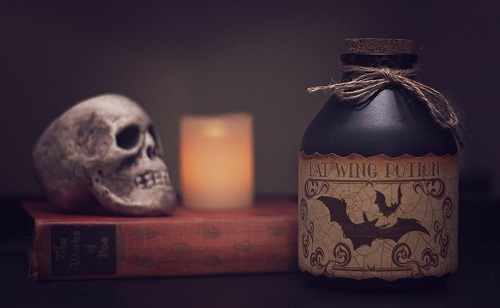 That’s why our team of mums have gathered a range of seriously spooky ideas for Halloween decorations that will not only frighten your grumpy neighbours but also bring the fun directly to your doorstep with little cost required! This intricate, jet black, hanging candelabra is truly ‘the thing’ to set the scene this Halloween. Swathed in black gauzy fabric, your little ones will love helping you out when it comes to assembling this paper decoration that features skulls and candles. Suspend it above your dining room table to spook your guests! Are you scared of clowns? (Don’t lie to yourself; we can see you getting goosebumps at just the thought!) Why not transform your home into a creepy circus with this seriously spooky scene setter made from vinyl sheets! Now, whilst we’ve never been one for clowns, it’s all our kids ever want to be for Halloween, so we know that this will definitely be a worthwhile investment! With this fantastic, yet eerily creepy Bat Gauze Draping kit, you can spook up your home for Halloween! The bat-tastic creepy cloth decoration will be sure to drive your family and guests ‘bat-ty’ by transforming your home into a house of horror! This easy-to-assemble kit comes with eight glittery bats and will be sure to add that gothic touch to your staircase or mantelpiece. At 37 inches tall, the googly-eyed “Eeek!” balloon is sure to make your little ones excited for Halloween! This fun Halloween decoration is sure to set the scene for the best party on the planet! A neat little trick that we found was that if you couple this balloon up with some other orange and green balloons, it makes the perfect Halloween balloon bouquet! So why limit yourself to a boring old pumpkin this season? Let’s get FREAKY! (Euphemism not intended). Have you dressed your house up for Halloween? We’d love to see your snaps over on our Facebook and Twitter.